Mangu is truly an iconic Dominican dish! Ask anyone, and they’ll close their eyes and nod, “yes!” There’s nothing like waking up on a weekend morning to the smell of salami frying and the onions simmering. It’s truly a kick a$$ dish and for good reasons! To start, we begin by mashing GREEN plantains– not the yellow ones! And green plantains altogether are just special. In all honesty, I prefer them to the yellow ones– but that’s because I’m half Dominican. Dominicans and platanos are essentially synonymous. The two go hand in hand. Afterwards, we add butter and top the whole thing off with Los Tres Golpes aka The Three Hits: Fried Salami, Cheese, and Egg! The combination is down right magical that I’m amazed this wasn’t once illegal– it’s THAT good! Now if you’re a Mangu hater or non-lover, kindly and quietly exit stage left. This dish is a powerhouse. A legend. A gift from God…. And yes, I love it that much. 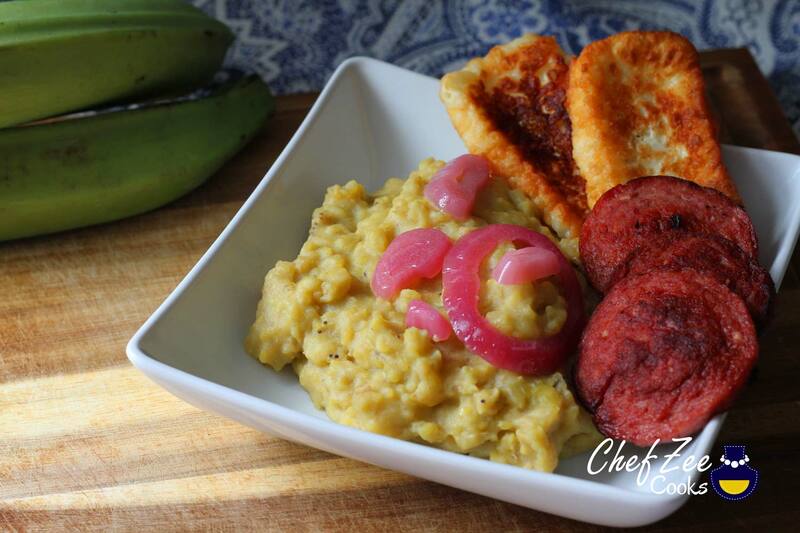 Mangu is the definition of growing up Dominican and signifies comfort food. Now if you’ve never had Mangu, I’ll warn you–the texture may through you off. It’s mashed green plantains, which is actually really similar to mashed potatoes just slightly thicker. It’s worth the try. Your tastebuds will thank you forever! It’s also important to note that not all Mangu is created equally. Some people use butter while others only use the sauce from the sauteed onions. And then there’s people like me who like to combine both– yes, both! There are also people who prefer their Mangu lumpy while other like it super smooth. Depending on the crowd, you may also be one of those people who likes it dry or a little wet. If you haven’t guessed, there’s a million different ways to make Mangu! Some are tastier than others, but all are usually down right delicious. Mangu is also really personal. I make a pretty good Mangu but it doesn’t hold a candle to my grandmother’s mangu. Hers was perfectly balanced, seasoned, and mashed. These things are super important. Everything has to come together for Mangu to unleash its magical powers which is comatose! After chowing down on Mangu, you really don’t have to eat the rest of the day. It’s the breakfast of kings and champions all in one. After a hefty nap, you can conquer the world! Mangu also builds tradition. Ask any Dominican about this dish and it usually involves memories with families. Growing up, my grandmother would make this every Saturday morning. It then switched to Saturday night and eventually Sunday morning. It’s fairly labor intensive since you literally need to have 3 pots going at the same time– but what traditional breakfast meal isn’t? Have you ever noticed just how many pots and pans get dirty in the name of breakfast/brunch? … Hint, it’s A LOT! My grandmother is no longer with us, and I surely don’t eat Mangu every weekend– although, I wish I could. But I still make sure to have a family tradition surrounding this dish. It’s a dish that’s so deeply rooted in culture, I’d hate to lose it. Most importantly, I’d hate for my future kids to not grow up eating it and fan-girling/boying over it. In fact, every Christmas morning my boyfriend and I host a Christmas brunch. We make Dominican coffee, open gifts with family, and right after I begin frying up the cheese, salami, and eggs for the mangu. Christmas and Mangu go hand-in-hand. I honestly can’t wait to have kids so that they can be right beside me as I teach them the magic of this dish! Now before I share the recipe do be sure to check out some Mangu’s Do’s & Don’ts. They matter, especially if you want a flawless Mangu! Feel free to Pin this to your board! 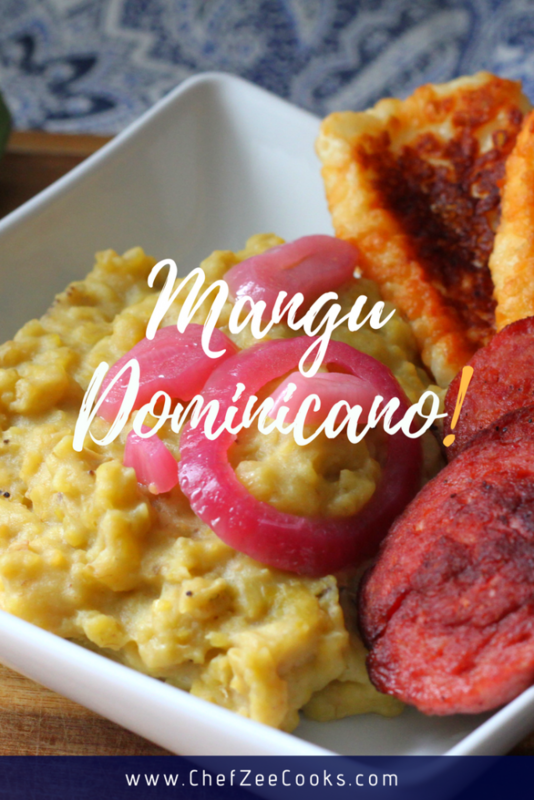 Don’t forget to check out my step-by-step video on How to Make Mangu Dominicano! Cut onions into rings then add vinegar and a pinch of salt. Set aside. Mangu must be eaten when warm. Once it cool it will lose velvety texture. To avoid, feel free to mash plantains with cold water. This will slow down the rate at which the mangu hardens and loses texture.